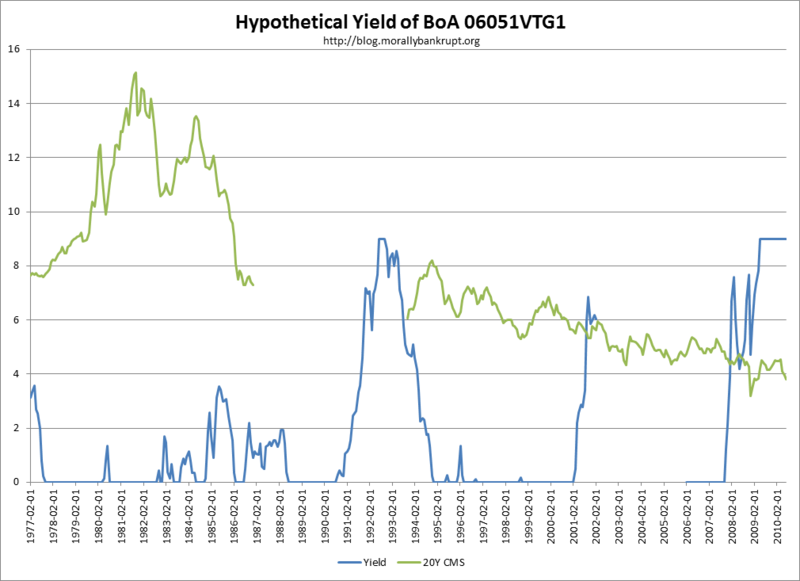 If BoA finds a cheaper way of funding debt, they can call you. This means that as interest rates drop on the far side, the CD exhibits negative convexity. That is, it has a a ceiling for what it will trade at, because it has an embedded short call option, and declines in interest rates won't benefit you as the holder. This is more of an issue with fixed-coupons though, because here you are already exposed to rates via the floating feature. (30YCMS - 2YCMS - 0.875%) * . What does this mean? 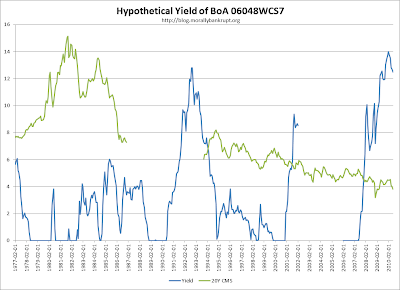 it means that the coupon of the bond is computed by taking the constant-maturity spread between the 30 and 2-year treasuries, subtracting 87.5bps and multiplying whatever is left by four. Your yield is primarily a function of the 30-2 spread. If the spread is above 87.5bps you get paid, if it isn't, you won't. 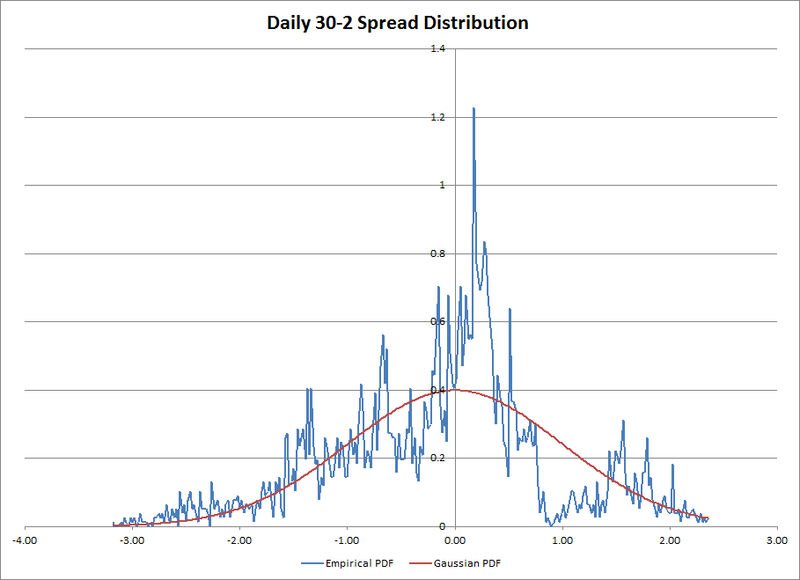 In case you are wondering, the historical mean of the daily spread (Feb 1977- Aug 2010) is 90 basis points. That doesn't include the period between Feb 2002 and Feb 2006 when the treasury stopped issuing 30s. (The spread trended down during this period). The spread as of yesterday was 351 basis points. The all-time high is 384 basis points. Any spread above 312.5 basis points will hit the cap. Blue (left-scale) is spread. Red (Right scale) is 20YCMS. From Feb 2002 to Feb 2006 no 30Y Treasury was issued. 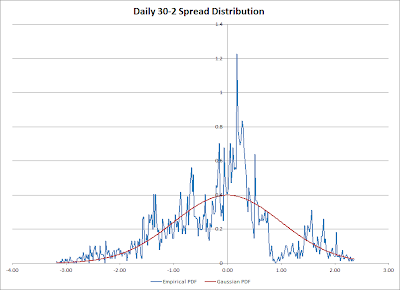 The distribution of the daily data points. The curves have an area of 1 (100%) and the horizontal scale is measured in standard deviations. With the spread at historically high rates, if one expects mean-reversion, one would expect the spread to fall back to it's historical range. Additionally, There has been 6 periods over the last 30 years when the spread has actually been negative. We can see the distribution is highly leptokurtic and reasonably balanced, so about half of the collected data-points fall bellow the mean of 90 basis points. That means that on about half of the days in the last 34 years, this note would have been yielding zero. That hurts. Pretty self-explanatory, we know that no matter what, 9% is the most the bonds will pay. This will only be an issue if rates rise significantly and very quickly, as the 9% cap is way, way above what the 20Y Treasury is paying. It does, however, limit your yield at times like today, when the 30-2 spread is so close to historical highs. Wall St. is smarter than you. 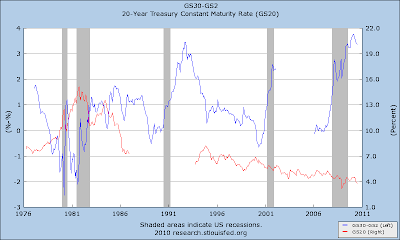 You are not going to get an FDIC-insured note yielding 9% for 20 years when the 20Y treasury is yielding under 4% just because you deserve the extra yield. Every part of this note has been engineered to take advantage of yield hogs' greed. If I had to put my hand in the fire, I'd say whoever buys this note is going to be holding a note that yields zero for a very, very long time. 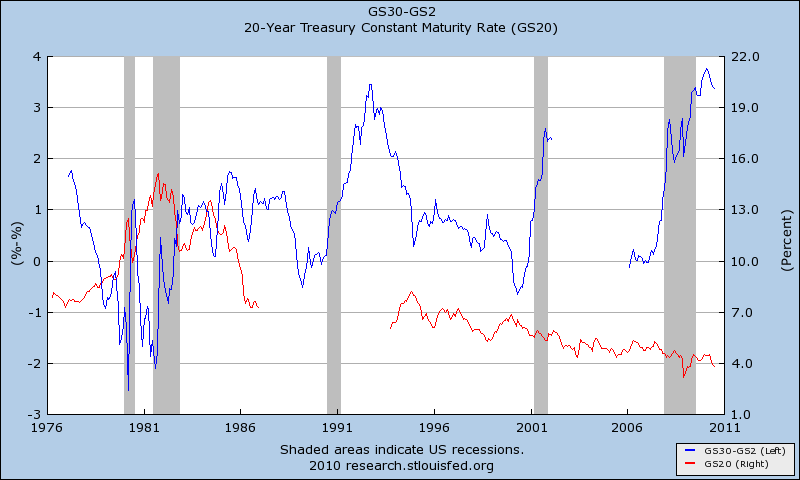 Below I attached a second graph for a similar note that's a little more attractive, but lacks FDIC-insurance. The same things apply, it's just the formula that's a little different. Structured Notes are 'Next Bubble,' Whalen Says. What's a chart of Japan's 30-2 spreads look like over the last 20 years? 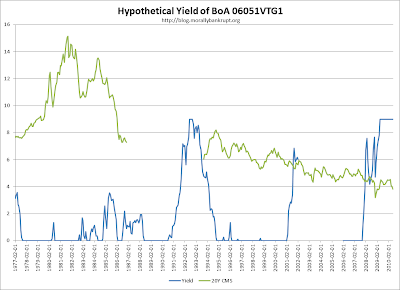 If you buy the fact that the Fed won't be raising rates for 2 years or more and then only gradually the current high spread might stay elevated longer than the history in those charts would lead you to believe and the only semi-near proxy to that belief that I know of is what Japan's spreads have done in their stagnation period. I agree though that clearly these notes are a horrible bet if anything close to those charts is what we have in store for the next 20 years.